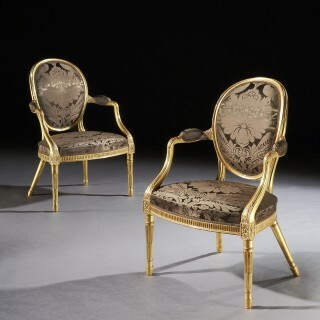 A very fine pair of George III giltwood armchairs in the manner of Mayhew & Ince. 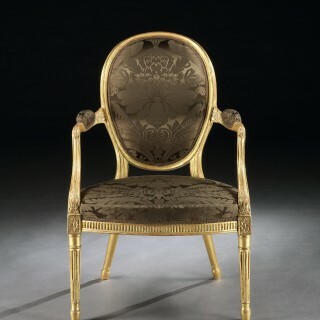 With oval giltwood framed backs, the curved seat frame with fluted frieze above fluted legs headed by paterae. The partnership of William Ince & John Mayhew was one of the most successful cabinetmaking firms of the Georgian era. 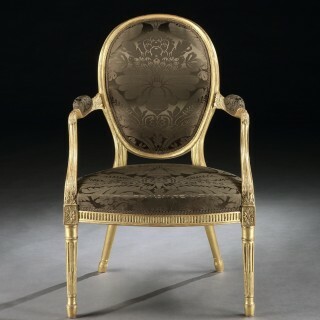 Mayhew was originally apprenticed to William Bradshaw, the upholsterer, of Soho Square, and Ince apprenticed to John West of Cocent Garden from 1752 until West’s death in 1758. The partnership ran from 1759 to 1809 in London, with workshops in Broad Street, Soho followed by a space on Marshall Street, Carnaby Market. Initially describing themselves as ‘cabinet makers, carvers and upholders,’ this was variously amended over the term of the partnership to include such terms as ‘dealers in plate glass,’ the categories of ‘cabinetmaker’ and ‘upholsterer,’ however, remaining constant. In 1762 Ince & Mayhew published the Universal System of Household Furniture dedicated to the Duke of Marlborough. It was a folio of drawings and descriptions in both English and French that was produced in direct competition to their biggest trade competitor, Thomas Chippendale. Chippendale’s The Gentleman and Cabinet Makers Director (which Ince had been a subscriber to) had first been published in 1754 and circulated around the country to the mainly aristocratic subscribers. Fairly quickly it became the industry standard amongst regional and colonial cabinet-makers. 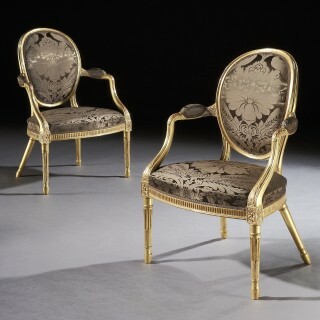 It established Chippendale’s name, not only as a manufacturer of furniture but possibly the first interior designer, advising his noble clients on their overall project, from the colour of their walls to their soft furnishings. Ince & Mayhew quickly realised the commercial benefits of producing such a body of work and quickly followed suit. Mayhew and Ince’s style was altogether more classical than that of Thomas Chippendale with elaborate use of inlaid woods and marquetry. They were very much influenced by the French taste. They worked closely with Robert Adam, most notably for Sir John Whitwell at Audley End in 1767, for the Duchess of Northumberland in 1771, for the Earl of Kerry in 1771 and, most importantly for the Duchess of Manchester in 1775 creating the Kimbolton Cabinet.